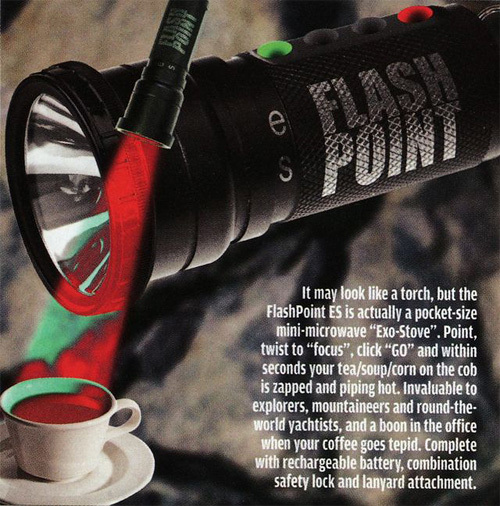 FlashPoint Mini-Microwave Torch | OhGizmo! I came across this unique ‘flashlight’ over at bookofjoe who found it in the Financial Times ‘How To Spend It’ magazine. (I’m assuming that’s where the scan came from.) And while it might look like your run-of-the-mill flashlight, instead of lighting your way down a dark corridor the FlashPoint ‘Exo-Stove’ is actually a handheld mini-microwave that can be used for heating beverages or food in mere seconds. Besides the pocket-friendly design, the FlashPoint includes a rechargeable battery (I’ve no idea how long it lasts per charge) and a combination safety lock since I’m pretty sure you don’t want this thing accidentally turning on when it’s in your pocket or backpack. Unfortunately though I can’t seem to find any trace of the FlashPoint online, and have no clue where one could actually buy it. Has anyone ever come across one of these before? I’m assuming the Financial Times isn’t into Photoshop pranks right? Finally a sure fire way to give people both cancer and third degree burns from a somewhat safe distance. Microwave ovens depend on the reflections of the metal walls to build up standing waves. And I don't think the governments (at least not the Western ones) would sanction the production of a device that could cause microwave burns and cancer. Probably just some bozos Photoshop dreaming or an art student's made-up ad presentation. This wouldn't work (has even been tested by Mythbusters, they tried to cook a chicken with a radar dish) and would be dangerous as hell. Besides, you batteries wouldn't last a minute. Its the “patent pending” part that gives it away, this is a concept which has not been produced.